Nearly 30 men have been sentenced for their part in a bike gang's five-hour rampage through Birmingham. They branded their so-called ride out "Take Back the Streets", said police investigating the illegal rally of 2016. Acting "as though they owned the road", riders on quad bikes, scramblers and mopeds mounted pavements, did wheelies between cars and "surrounded motorists who did not obey commands". Two of the 29 convicted were jailed. The prison sentences were handed down at Birmingham Crown Court on Thursday, with most of the others given a mix of suspended prison sentences and community orders in hearings earlier in the week. Andrew Tomlinson, 29, of no fixed abode - described by police as the ringleader - was jailed for two years, while Matthew Sidwell, 30, of no fixed abode, was given a 12-month prison sentence. All but one of the 29 admitted causing public nuisance. Jack Bentley, 24, of Marlborough Road, Castle Bromwich, denied the charge, but was found guilty by a jury and given an eight-month suspended prison sentence and ordered to carry out 50 hours of community work. Locations during the rally of 26 June 2016 including Broad Street in Birmingham city centre, where there was a "massed rank of riders causing carnage", according to police. They also rode into the neighbouring borough of Solihull. The West Midlands force trawled through social media and police video footage to identify offenders. Ch Supt Dave Sturman said: "There is no justification for this type of behaviour: they risk serious injury to themselves, other road users and members of the public. "They acted as though they owned the road, holding up traffic and aggressively surrounding motorists who didn't obey their commands." Four men previously named by the BBC on entry of not-guilty pleas were discharged, and were among 19 accused but not convicted. They are Ryan Pointon, 26, from Oak Road, Oldbury, plus Birmingham men John Murphy, 33, from Beechdene Grove, Erdington; Jordan Harris, 20, from Rilestone Road, Quinton; and Ethan Nerwall, 20, from Fairford Road, Erdington. Thomas Aston (25) from Plane Tree Road, Sutton Coldfield. 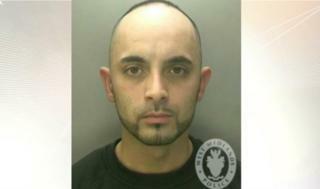 Karim and Ward are due to be sentenced on 29 March.